Home / Blog / Post-Nuptial Agreements v. Reconciliation Agreements: Are they worth the paper they're written on? A Prenuptial Agreement was discussed but never signed: Occasionally, an engaged couple will discuss preparing and signing a prenuptial agreement, but for some reason or another, it never occurred, so the spouses agree to draft a post-nuptial agreement. Inheritance: During the marriage one spouse may inherit a large sum of money. The marriage might be “on the rocks” or “shaky” so the inheriting spouse wants protect the inheritance. Another example could be when a spouse inherits a large sum of money and because of this, wants to purchase a new home or some other asset but wants to protect his/her financial interests. At the time of purchase, the marriage may be strong, but the spouse wants to protect the asset anyway “just in case” and have the property considered “separate property” and not subject to distribution in a divorce. Debt: Sometimes during a marriage, one spouse will incur a significant amount of debt. 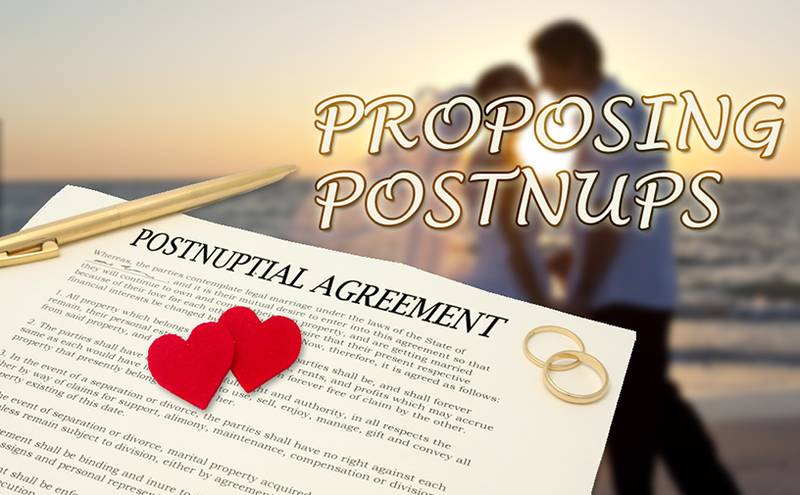 The spouse who did not incur the debt may want to draft a post-nuptial agreement to limit his/her liability. Although there are many reasons a spouse may want to draft and sign a post-nuptial agreement, these agreements are rarely enforceable. There is a high burden of proof in establishing the validity and enforceability of a post-nuptial agreement. When a person enters into a prenuptial agreement, there is no duty owed to the other person; it is like entering into a business contract. However, when spouses enter into a post-nuptial agreement, there is a fiduciary duty owed by each spouse. That means that each person is supposed to act in the best interest of the other, which may be contrary to the terms of a post-nuptial agreement. Independent Legal Counsel: Just as with prenuptial agreements, each spouse should retain their own attorney to review the agreement. If one spouse does not retain their own attorney, the Court will often times examine a post-nuptial agreement even more closely to determine if the agreement is fair and equitable or a court may not enforce the post-nuptial agreement all together. Full and complete disclosure: There needs to be full and complete disclosure of all assets and the reasons behind seeking a post-nuptial agreement. No Coercion, Fraud or Duress: A post-nuptial agreement cannot be a “take it or leave it” document. For example, a spouse cannot say “sign this agreement or I will divorce you.” This would make the post-nuptial agreement coercive and therefore unenforceable. Fair and Equitable: The agreement must be fair and equitable to both parties at the time it is drafted and signed. This is a very high standard to abide by when drafting post-nuptial agreements. That is why these agreements are often times found invalid. Although post-nuptial agreements sometimes may seem like the best choice, they are not often enforceable. Although post-nuptial agreements are difficult to enforce, there is type of post-nuptial agreement more specifically referred to as a “reconciliation agreement.” A reconciliation agreement is made when the “marital relationship has deteriorated at least to the brink of an indefinite separation or a suit for divorce.” Nicholson v. Nicholson, 199 N.J. Super. 525 (App. Div. 1985). This means that the marriage has broken down so significantly and that the marital rift was so substantial that a divorce is almost certainly imminent. A reconciliation agreement is different from a typical post-nuptial agreement because a separation or divorce is already in the process rather than just a possibility. The willingness to enter into a reconciliation agreement must come from more than marital discourse as the courts will not enforce every spousal promise that was made to relieve marital tension. Unlike a post-nuptial agreement, courts tend to favor reconciliation agreements. This is because they are designed to preserve the marriage rather than make up for some “indiscretion.” Reconciliation Agreements have a much lower burden of proof to determine the agreements validity and enforceability. The agreement must be conscionable, fair and equitable, and made in good faith to be enforceable. If you are considering entering into post-nuptial agreement or reconciliation, you should consult with an attorney. At Ruvolo Law Group, LLC, we are experienced in drafting such agreements.